I came across this quote while I was trolling the web this evening, and I can’t stop thinking about it. 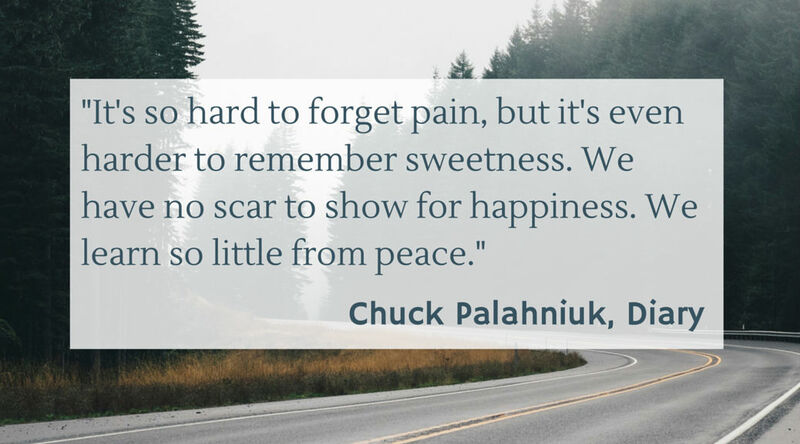 Pain seems to stick harder than sweetness in life, and try as I might, the fear associated with pain often trumps the joy associated with sweetness. There’s a saying in sales that pain is the greatest motivator. That is, a potential client will respond most quickly to pain avoidance than an investment in pleasure. Present pain is more tangible and real than some theoretical future pleasure. That’s why it costs so much more to get a busted pipe fixed in the middle of the night than it does in the middle of the day. They sell you on the idea that you’re paying more for inconveniencing some poor plumber, but the reality is that you’ll pay just about anything to get your busted pipe fixed during off-hours because your house is being ruined by the minute. On the other hand, spending some time and money every few months on preventive maintenance is something only a minority of folks bother with because of the power of denial. My father-in-law was warned to watch his diet after a heart attack, but he never really adjusted his diet…and ended up dying of a heart attack. Fear does more damage in this world that just about anything. Why is this? I can’t believe that God designed us this way. Is this part of our fallen nature? The most uttered phrase by Jesus, according to the New Testament, was “fear not,” and that should give us some clue as to the power of fear, along with God’s view of it. We are so prone to forget God’s track record in our lives and rely upon our own power and understanding of the world to work out our hopes and dreams and disappointments and failures. Because we are frail and forgetful, we are overwhelmed by our troubles and the pain associated with them. Though some may have higher thresholds, none are immune to the crippling power of fear. So, what are we to do? How do we live in the sweetness? I don’t think there are easy answers to these questions, else everyone would be happy and well-adjusted, but I’ve found that one thing helps to keep me focused on the positives – counting my blessings. I’ve written about here before, and as simplistic as it seems, for me, this practice helps me – especially when fears snare me. I’ve come to think of fear as a cancer or a lie, and treat it as such. To indulge in fear is to go from a two-pack-a-day smoking habit to four, or to live with liars. Fear is a robber and a killer.